Let’s take a break and talk about the weather, shall we? Although I’m mostly a programmer, one of my hobbies is monitoring the weather, and I even do a bit of storm chasing. Usually, storm chasing is done in the Spring, Summer, and sometimes the Fall. Surely not in January, right? Wrong. I live in the Midwest – Northern IN/IL area to be exact. Early January is usually a time for snow. Here are a few pictures of the snow we got on New Years Eve. Typical of this area. It wasn’t very encouraging. It seemed that the NWS wasn’t prepared for a winter severe weather event. Later that day, the SPC did issue a Slight Risk, but that was far too south for us to reach. It wasn’t until their afternoon outlook that they iussued a wide-spread Slight Risk. That was good enough for me. We hit the road shortly after that outlook was published. It took me so long to write up a post about it, so I don’t remember that much about it. What I do remember was that it was like Spring. It was well in the 60s and humid. The funniest thing was that we still saw snow in some of the ditches and Christmas decorations on some houses…and we were chasing storms. When we got to our destination, it was already starting to get dark (remember, It’s January), so the pictures weren’t very impressive. We did not see any tornadoes, just the usual wall clouds. 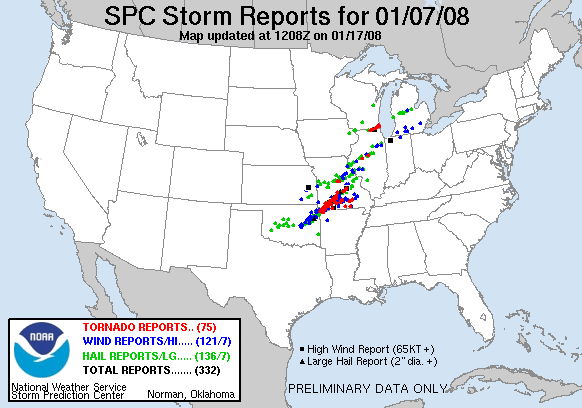 It turned out that 75 tornadoes touched down before the day was over. Kudos to Tony that predicted it way ahead of the SPC, and if this is a sign of things to come this Spring, hold on your your hats. This entry was posted on Friday, March 7th, 2008 at 12:43 pm	and is filed under Weather. You can follow any responses to this entry through the RSS 2.0 feed. You can leave a response, or trackback from your own site.